Today's story unfolded in reverse to the usual way I post these blogs. I happened across this article in The Australian recently, and decided that I had to write about it too. Also this article in New Farm Village News. The articles discuss Brisbane architect Robert Riddel's recent restoration of this old furniture store in Fortitude Valley. Thanks to Google Maps, this is how the building looked prior to its recent restoration. 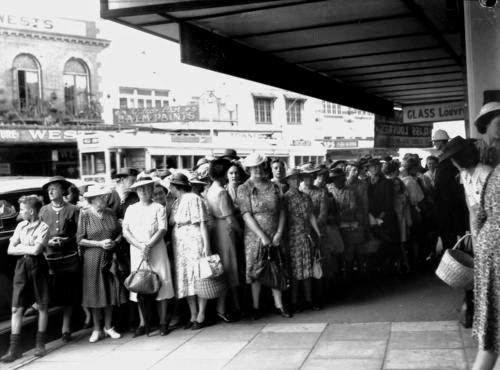 Here is West's Furniture Emporium in 1953, over the road from this crowd of shoppers - you can just see the sign "West's" behind the Brisbane tram. West's Furniture Emporium's new showroom was designed by Karl Langer in 1953, and according to the articles mentioned above, it was a highly unusual work for the time. It featured sloping glass windows at the front - and incorporated at the base of the windows was a fish pond! If you click on this link, you will be transported to Riddel Architectures web pages, where you can admire the stylish restoration of this building presented in a much better way than I could do it. It's wonderful to see someone taking the initiative to restore a building rather than knocking it down and starting over.